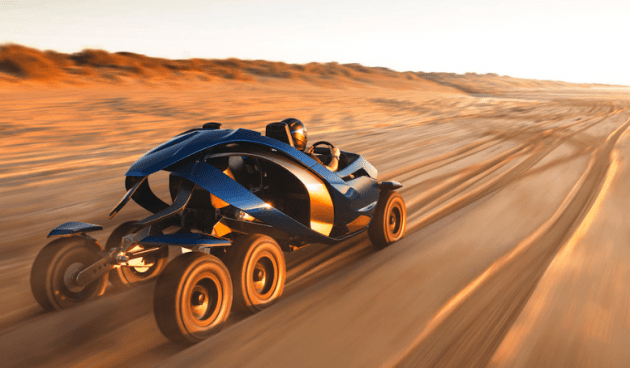 Looking like it rolled off a science fiction movie set is the Ferox Azaris six-wheeler which comes with a BMW Motorrad R1200 boxer engine and fluid drive. 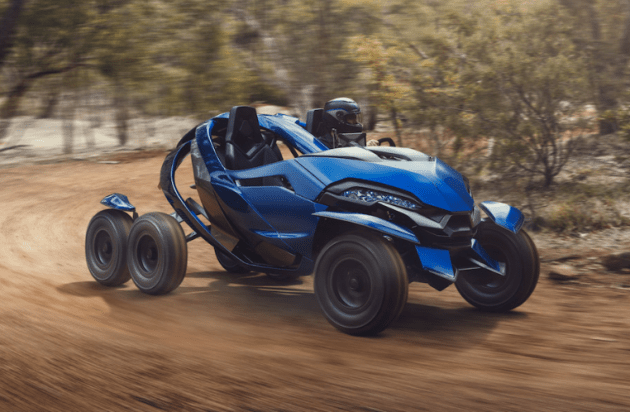 Taking a side-by-side all terrain vehicle (ATV) as a basis, the Azaris uses in-wheel motors to drive the four rear wheels, with a claimed 98% efficiency. Designed as a technology demonstrator, the Azaris focuses on the rear suspension which uses a pair of rocker arms that isolate the chassis from excessive movement. The 125 hp two-cylinder boxer mill used in BMW Motorrad’s R-series motorcycles is located back-to-front in the rear of the Azaris and dedicated to running a hydraulic pump. The pressurised fluid comprising of 95% water with the balance being additives is then fed through 3D printed channels in the suspension rocker arms to the in-wheel motors. With the wheels mounted directly to the four motors, Ferox says the Azaris will handle some 678 Nm of torque per wheel and there are bigger motors which are capable of delivering 1,152 Nm, reports website Newatlas.com. Tony Wheeler, chief executive officer of Perth, Australia based Ferox, says fluid drive offers a weight savings over electric hub drives, with the equivalent electric motor weighing 30 kg to the Azaris’ 11 kg in-wheel motor. “The whole system is incredibly responsive – and that’s a big difference to traditional hydraulics. Usually they’re quite jerky. But our system has a high startup torque, similar to an electric motor,” says Wheeler. Wheeler also says drive for the pump in the Azaris can be electrically driven instead of using an internal combustion engine and an electric motor would better complement the fluid drive system. Since fluids have a natural tendency to self balance, a differential is not necessary in the Azaris. Plans for the fluid drive technology developed by Ferox are not limited to recreational off-road use but rather in autonomous agricultural robots, modular heavy vehicle and cargo haulers. Also in the list of future plans is military use where the fluid transmission is impervious to electronic jamming and EMP. Although the Azaris has not been fully-tested in an off-road environment as yet, the prototype six-wheeler has moved under its own power on tarmac with proper rough surface testing to begin in 2019, along with the promise of video. There are currently no plans to bring the Forex Azaris to the market despite enquiries but Wheeler did not rule out making a limited run of Azaris as a rolling piece of art in unique colours and trim. The post Ferox Azaris – fluid drive six-wheeler with BMW power appeared first on Paul Tan’s Automotive News.